Backgammon Guru Pro features an attractive backgammon board and supports natural checker movement where both dragging and tapping are supported. You can play against the computer or with a friend. Backgammon Guru Pro supports standard Backgammon as well as HyperGammon. It will also allow you to set up any desired position for play and analysis. Backgammon Guru Pro will answer your "what-if" questions, like what if there was a specific roll in a specific position and what's the best possible move there. In the default Player-Tutor mode, e.g. when you are playing against a master-strength AI, Backgammon Guru Pro will allow you to substitute a random roll with any specific roll of your choice. You will be able to take back and replay multiple moves as Backgammon Guru Pro supports unlimited undo functionality. 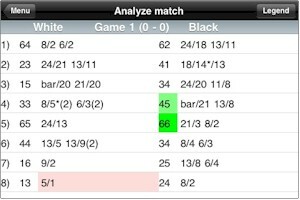 Backgammon Guru Pro will analyze your match and color-code your errors in a move list. You will be able to navigate your move list interactively and see where you could have played better. You can also email the match to yourself for further analysis. Backgammon Guru Pro by default continuosly shows the equity graph and it can also show, upon request, the detailed statistical chances and best possible moves in any position. Backgammon Guru Pro supports 4 different skill levels, multi-point matches, doubling, Crawford rule. Backgammon Guru Pro indicates pip count for players, supports long moves, sound effects and multiple other options.